Adding color to your homemade bath bombs is a quick way to make them look more exciting. You can make solid-colored bombs, speckled bombs, or even add a corresponding scent and color to your recipe. This article will let you know which products are best for this process, so the quality of your creations is never compromised. Whether you make bath bombs for yourself, to give as gifts, or for your business, color is a must. Because of the materials likely used in your bath bomb recipe, the end results are usually just white. But adding color is simpler than it may seem. The colorant can be added when the bath bombs are still in their liquid phase, or when they are in their dry phase. It’s a bit easier adding color when the recipe is still in its liquid phase, but the main difference between the phase you add the colorant is an aesthetic one. For those who prefer solid colors in their end results, adding it to the liquid is best, while those who like the speckled effect should add it while it’s still dry. To prevent tub stains, you should always consider an additive like Polysorbate 80 in your bath bombs. As you will soon learn, bath bombs are very versatile in terms of color. Colorants are made in many different ways, from water-based dyes to micas, to oxides. The amount of these colorants you add to your recipe will determine the shade of color you’re left with. Using less will, of course, result in paler shades of color. Keep in mind that less is more, especially when you’re still getting familiar with a colorant. Each of the following colorants was selected for its safety for use in bath bombs. They each produce vibrant colors and provide great value for their prices based on user reviews. If you need a lot of colors to work with, this variety pack of Holi Color Powder should suit your needs. Each packet is 70g and comes in magenta, pink, purple, green, yellow, and more. You will also get a free packet of white with your purchase. These premium, brilliant, fun, and safe color powders are ideal for not only bath bombs, but fundraisers, photo shoots, and parties. Chameleon Colors has been creating non-hazardous, non-toxic, and 100 percent safe color powder for years. Their products are made with cornstarch and cosmetic-grade color dyes that meet FDA standards for safety. This product was inspired by the Holi Festival in India, where people throw colored powders and cover their surroundings in vibrant hues. Inspired by India and made in America, the colorant is crafted in a food grade facility with quality processes and ingredients. Each ingredient used is D&C and FD&C approved, resulting in a reliable and premium product. The packets are easy to open and simple to use. The powder is very fine and similar to the consistency of crushed chalk, making it easy to mix. 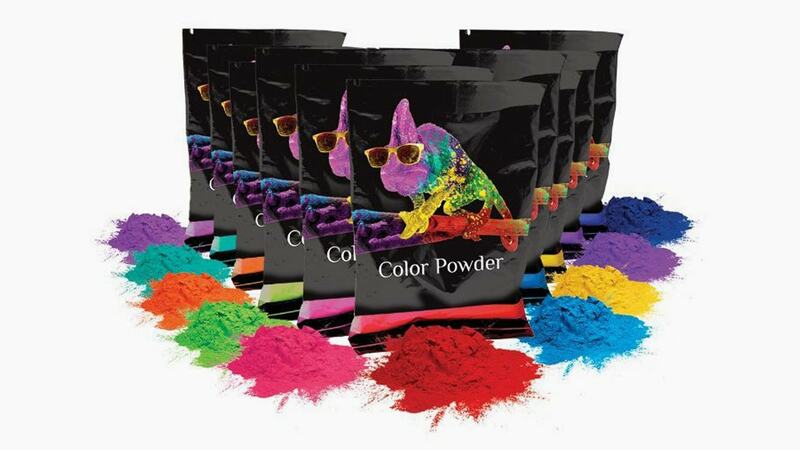 The colors blend together easily to make new colors and each bag comes with enough powder to be used again. The hues are all very vibrant, ensuring that your bath bombs will turn out nice and bright. As a bonus, they come scented and smell similar to different fruits or candies. The colors are perfect for dry use and won’t stain your hair or skin like other colorants. These Holi Color Powders are relatively easy to clean up and are priced fairly for the amount of powder you receive. The powder isn’t clumpy at all and will mix with your bath bomb recipe easily. Some bath bomb creators will prefer to work with liquid colorants over a powdered product. This Liquid Soap Dye by How to Look PRETTY is safe for your skin, food grade quality, gluten-free, and vegan. When you order it, you will receive 10 soap slime colors and a natural coloring e-guide on using this dye for making soap. This color has been crafted to have a high concentration of color while being gentle for your skin and safe enough for your children or baby. It can be used in cold press soaps in addition to bath bombs, along with melt and pour soaps, hand soap, body scrub, and shampoo. This gentle formula comes in Charcoal Grey, Walnut, Pink, Lavender Lilac, Tangerine, Rose, and more. When you use this dye with your bath bomb recipe, you will find that the hues look just as you’d expect them to. Since your bath bomb recipe is likely white to begin with, you might need to use more drops of color than you thought to turn it to the preferred color. But this is what coloring bath bombs is usually like. There are always pros and cons to different colorant types. While some will prefer powder for its convenience in photo project uses, others will prefer food colorants like this as it’s a familiar formula. Some also feel more comfortable using food colorant than other materials on themselves and their children. As with anything else, you should understand the pros and cons of your purchase, so read up on food colorants before deciding whether you prefer this over the powdered type. This liquid soap dye comes with that information in their e-guide. Though this product works well with soaps and bath bomb recipes, you should use wax when you’re making candles as the colorant wasn’t meant for that purpose. The original colorant formula crafted by this brand addressed the common issues of the ring around the bathtub and color being left on your skin after use. They have since improved their recipe to make fewer drops necessary for the effect you want, reducing the risk of these downsides. Not only does using fewer drops make the product more affordable, but it won’t turn your skin the color of your latest bath bomb. Another liquid colorant option on our list, these Ktdorns 10 Liquid Colors come in 0.24-oz bottles and include a variety of choices. Although the bottles do look small, the color is highly pigmented and you only need a little bit to get the result you want. Use green, blue, or purple for your bath bomb recipe, or mix your own colors. Each color has been uniquely crafted to work well in lotions, body scrubs, bath salts, and soaps, along with bath bombs. The colors that come in this set are the perfect combination to create a variety of colorful soaps and bath bombs. The dye comes in a convenient squeeze bottle with a child-proof lid and drop tube top. Although it is labeled as a soap making dye, it does work well for bath bombs. The green is very vibrant and reminiscent of nature while the yellow is bright and the red pops. The colors are high-quality but must be mixed well for a good end result. As with any other product, closely observe the instructions with this dye to get the bath bombs you are hoping for. Users reported great results with most colors with the possible exception of pink, which fades quicker than the others. Although the colors don’t come with any scents, they can be mixed with essential oils or other scented products to create the fragrance you want. Use lavender with the purple dye, for instance, or cinnamon with red. Like the other products on our list, this dye isn’t good for candle-making, even though it’s listed as suitable for that purpose. This colorant won’t mix with wax at all and instead should only be used for bath and body purposes and soap. 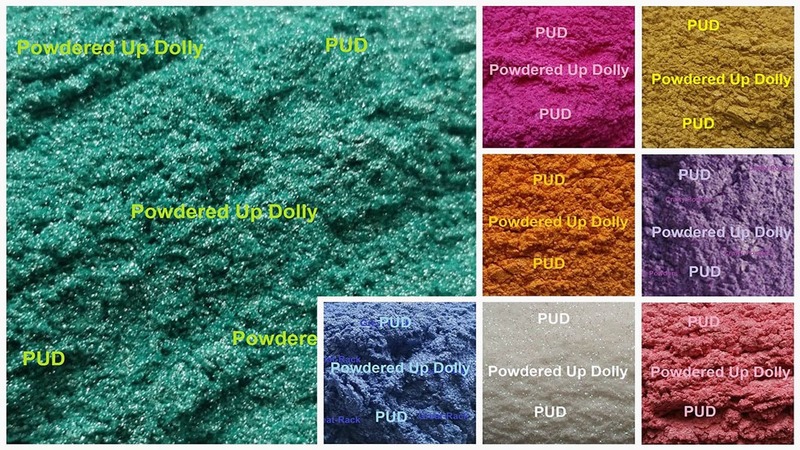 If you are also a soap-maker and want your soaps to have a shimmery finish, this Mineral Mica Powder by Powdered up Dolly is the best choice on our list. 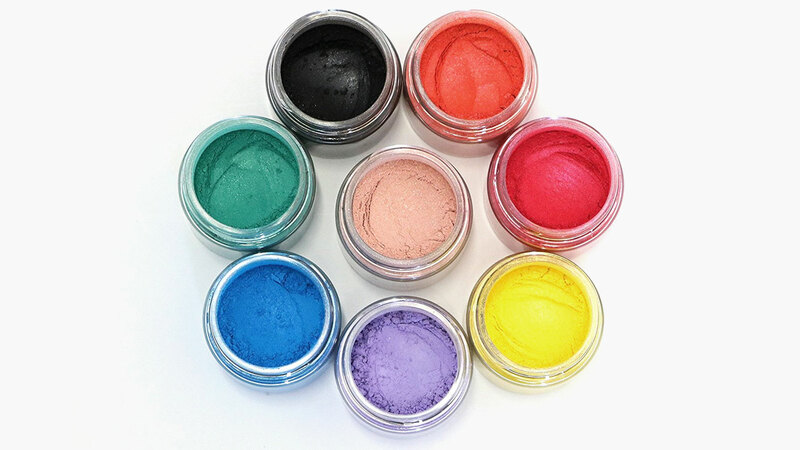 This cosmetic colorant will come in quantities of 2.5g, making a total of 20g of color. allowing you to test out which colors you prefer. You will get 8 colors when you order, including gold, purple, fuchsia, orange, teal, and more. These can be used for homemade cosmetics like nails, blush, and eye shadow, along with bath bomb and soap-making projects. You may also use these in shower gel, lotion, and lip gloss. The colors blend very well and can be mixed together to get that perfect hue. These work the best in clear bases if you want the shimmery end result, although they do work with white powders as an opaque colorant. If the idea of using mineral-based colorants appeals to you, you will enjoy this Mica powder soap dye. Users reported that the customer service from this company was great. Note that these cannot be used for cold press soaps and may leave some color on your tub, though it washes off easily. For another Mica-based option, consider these MICA Colorants. They come in unique colors, including Red Orange, Orchid Iris, Shining Yellow, Emerald Green, Islands Coral, and Artisan Wheat, plus more. These cosmetic grade dyes are perfect for a wide range of projects including homemade mineral makeup, soap making, and of course, bath bombs. You can use these colors on their own or mixed with primary colors to create unique hues. The colors won’t bleed or morph. In order to use these in your bath bomb recipe, just add the amount you desire to the dry ingredients and blend thoroughly. Adding these powders to the white base will result in amazing pastel results. As stated in the introduction, Polysorbate 80 can help prevent staining or a colored ring on the tub after your bath. Some complain that when they ordered these colorant powders, they don’t come filled up all the way. Other users, on the other hand, reported that theirs were full to the brim with vibrant, beautiful micas. Either way, each jar is large, so the amount of color you get with your purchase makes this a highly affordable option. Some users may not appreciate that the colors aren’t labeled, but most won’t find this a problem. Bath bomb creators, even those very new to the craft, are always looking for ways to step up their creative process. Let’s look at some bases you should have covered before you start making them, so you can get an ideal result each time. 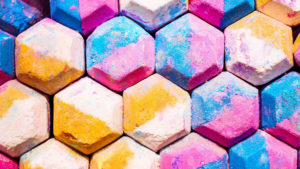 Fragrances for your Bath Bombs: You will soon find that the options for scenting your bath bombs are nearly as versatile as the options for coloring them. Most commonly, people use essential oils and fragrance oils for this purpose. However, you may also use CO2 Extracts, Attars, or Absolute Oils, all of which are highly concentrated fragrance options. When working with these, make sure you are thinking about the safety of the user’s skin. These oils should only be 5 percent or less of your entire bath bomb recipe.If you prefer to just add light scents to your bath bombs, you can choose to use floral water, Hydrosol, or another aromatic binding agent. In addition, aromatic butters and oils can be used to create a natural, light scent. Natural options like Organic Virgin Coconut Oil are popular in bath bomb-making for this reason. Visual Additives: Some bath bomb creators like to use additives for a visual element, such as whole herbs or flower petals. If you want to do this, make sure you calculate these into your powdered ingredients to get the right formula. You can add these materials during the shaping process or put them in earlier when you are mixing the other powders. Binding Agents: You will also need binding agents to keep the bath bombs from crumbling. Usually, water and oil are used for this purpose. Whatever you decide on should account for no more than 20 percent of your entire mix. Oils and hard butters, like Shea or Cocoa butter, can bind your ingredients without starting any chemical reactions. They will also make the bombs more moisturizing. These should be molded individually since these bombs only harden once they have cooled. Bath bombs crafted from these binding agents will likely end up more fragile than bombs made with water-based agents. Basic Assembly Rules: When you’re beginning your creation process, start by individually preparing all of the necessary ingredients. Mix the powdered materials together, then create the binding agent separately. The next step is to mix the binding agent with the powders, stirring continually so the ingredients blend well. When making your bath bombs with a water-based agent, use a spray bottle for mixing, wetting it gradually until it resembles snow in consistency. It should bind and pack in your hand without being too wet. As soon as you’ve reached this consistency, shape the mixture with the right tool or pack it into molds. Let these dry for up to 6 hours and store them in air-tight packages. Whether you are creating them for personal or professional use, following these general guidelines will help you get the best results with your homemade bath bombs.